The engine oil consumption is dependent on driving style and driving conditions. Your car is equipped with an electronic oil-level monitor. For precise measurement and display of the oil level, the engine must be at operating temperature, i.e. following at least 6.2 miles/10 km of uninterrupted driving. You can have the oil level displayed while you are driving, or while the vehicle is at a standstill on a level surface and the engine is running. 1. Push button 1in the turn signal/high beam lever up or down repeatedly until the appropriate symbol is shown in the display, accompanied by the word "OIL". The oil level is checked and the reading displayed. 2. Oil level is being checked. This can take about 3 minutes if the car is at a standstill on a level surface, or about 5 minutes while the car is on the move. Add engine oil as soon as possible, but no more than 1 US quart/1 liter, refer also to Adding engine oil on page 219. 4. Oil level is too high. Too much oil will harm the engine. Have the vehicle checked without delay. 5 The oil level sensor is defective. Do not add engine oil. You can continue your journey. Note the newly calculated distance remaining to the next oil service. Have the system checked as soon as possible. > "Engine oil level OK"
> "Measurement not possible at this time." This can take about 1 minute if the car is at a standstill on a level surface and the engine is running, and about 5 minutes while the car is moving. If engine oil was added, it may take up to 30 minutes to obtain an oil level reading. > "Engine oil level below minimum. Add 1 quart!" Add engine oil as soon as possible, but no more than 1 US quart/1 liter, refer also to Adding engine oil below. If the oil level is below the minimum value, add engine oil immediately to avoid engine damage. Have the vehicle checked immediately; otherwise, the excess oil may lead to engine damage. Do not add engine oil. Before continuing to drive, note the recalculated remaining mileage until the next oil change service, refer to Service requirements on page 74. Have the system checked as soon as possible. Do not add 1 US quart/1 liter of engine oil until a corresponding message is shown on the Control Display. Add oil within the next 125 miles/200 km; otherwise, the engine could be damaged. If the engine oil is too high, have the vehicle checked immediately; failure to do so may result in engine damage. Keep oils, greases, etc. out of the reach of children and comply with the relevant warnings on the containers. Otherwise, health hazards may result. Do not use oil additives as this could result in engine damage. When selecting an engine oil, make sure to use one from the SAE viscosity classes 0W-40, 0W-30, 5W-40 or 5W-30; failure to do so may result in malfunctions or engine damage. The engine oil quality is critical for the life of the engine. Some oil grades may not be available in all countries. 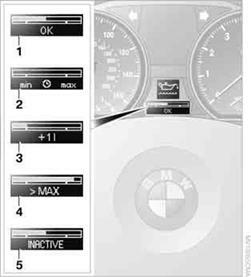 Additional information about approved oil grades is available at your BMW center. Oil changes should only be performed by a BMW center.